for world premiere of "Super Collider"
for the world premiere of Southworth's "Super Collider"
Music and Theatre's Gamelan Galak Tika group (a Balinese gamelan directed by Professor of Music Evan Ziporyn) will team up with the Kronos Quartet for the world premiere of MIT alum Christine Southworth's piece, Super Collider. The performance will also feature a set of new gamelan instruments designed and built by current and former MIT students. 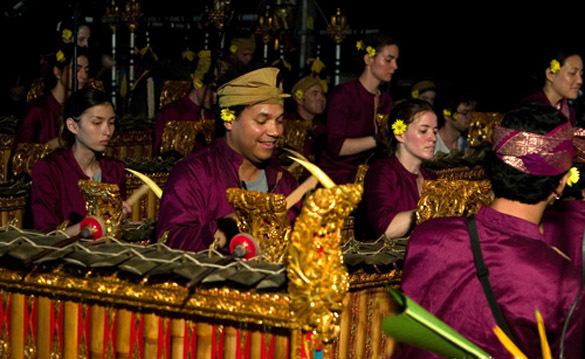 Gamelan Galak Tika (pictured above performing in Bali) is comprised of about 30 members, most of whom are MIT students and staff. The group is America's most innovative Balinese Gamelan. Led by composer and Professor of Music Evan Ziporyn, Galak Tika has performed groundbreaking music at Carnegie Hall, Lincoln Center, BAM, two Bang on a Can Marathons, at colleges in New England and New York, and throughout Bali, Indonesia. Galak Tika was formed in 1993 and is dedicated to comissioning and performing new works by Balinese and American composers, for gamelan and mixed ensembles of gamelan and Western instruments, as well as performing traditional Balinese music and dance. Galak Tika has multiple CDs available from Airplane Ears Music. The term gamelan means "to hammer" and generally refers to the large percussion orchestras of Java and Bali. The name "Galak Tika" is Bahasa Kawi (classical Javanese, a dialect of Sanskrit) that means "intense togetherness."